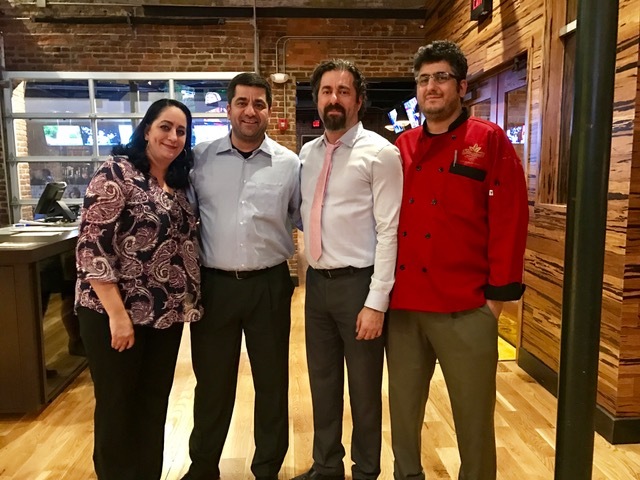 The Amra Brothers – and sister – welcome you to experience their dream first hand. 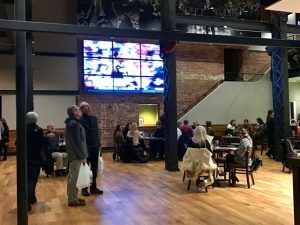 After many months of construction, the former Natty Greene space has been transformed into a destination that leaps right over the expectations of sports enthusiasts, foodies and families. Consider it like a cruise ship. There’s space for kids to enjoy a full range arcade, while fans and alumni cheer for their favorite teams and still others retreat upstairs to a quiet mezzanine area, where they can savor desserts like Hummingbird Cake. Sports fans will love the theater sized TV screen that truly is the next best thing to being in the stadium. Actually this is better, thanks to a long list of craft beers and brewery on site. Match this with nachos, sandwiches and burgers all made from scratch with local ingredients served by a friendly staff, and you have a perfect party. For those coming for the food and casual, spacious atmosphere, you’ll be surprised at the wide and innovative offerings of Chef Ryan Foxworth. At the soft opening, diners sampled from a range that began with Fried Green Tomatoes served with local goat cheese and peppadew pepper vinaigrette (a favorite! 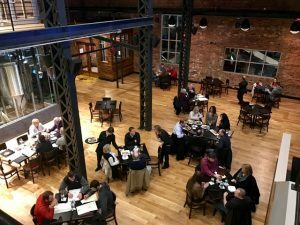 ), NC Prosciutto and Pimento Cheese Bruschetta, and crab-in-every-bite Blue Devil Sherry Crab Bisque, leading into entrees that included Black Eyed Pea Cakes, Jambalaya and Grilled Salmon on mashed potatoes with sautéed greens and tomato-basil relish. Agreement at our table was delight that the price point allowed for this to be a weeknight indulgence, providing a healthy, creative, and widely varied menu inviting many happy returns. For a neighborhood like Glenwood South, this recipe for hospitality hits the sweet spot for residents of all ages. Welcome back, Alex! Congratulations to you and your family!